Welcome to my Homemade Recipes for Psoriasis Page. 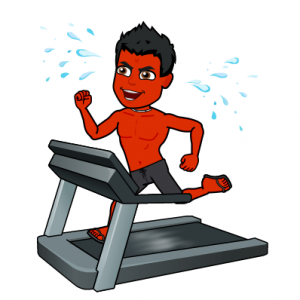 It is on this page that I will TRY to add at least 2 homemade recipes for psoriasis a day. These homemade recipes for psoriasis will help you heal your skin in due time. Eating these meals indefinitely will decrease inflammation, flakes, and given you follow my DON’T LIST and DO LIST on this website, you should have nothing to worry about. 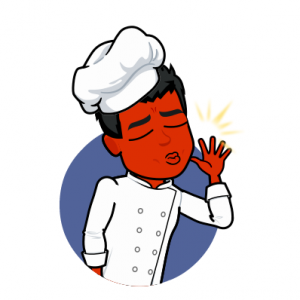 I am only adding homemade fish recipes and homemade vegetables recipes. By just eating fish and vegetables for the next several months, you will minimize time and maximize productiveness. Because the sooner you cure psoriasis the better. Following this homemade recipes for psoriasis list may take months to help you heal psoriasis but at least at the end of it you will get your skin and life back. 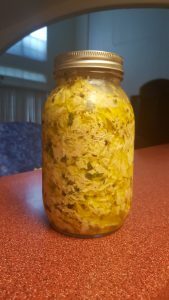 I didn’t want to go crazy eating the same food every day so I try to keep a large selection of homemade recipes available. 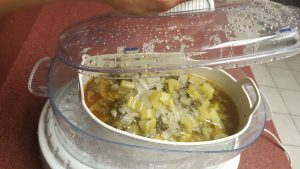 Feel free to add your own homemade recipes for psoriasis in the comment section and if I like it and approve of it, I will add it to my Homemade Recipes for Psoriasis List here at RemedyPsoriasisNaturally.com, and I will name the recipe after you or whatever you want to name it. 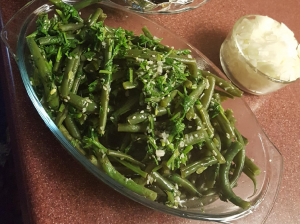 Example: Sarah Jones Homemade Green Beans or Sarah’s Homemade Killa Green Beans…lol. Whatever you think is clever. A cooking oil’s “smoke point” is when the oils molecular structure breaks down at a certain high temperature. This smoke point factor thus converts healthy oil into bad oil making it highly toxic. Because Safflower oil can withstand higher temperatures. Some recipes are recommend to be cooked with safflower oil instead. Because different oils have different smoke points, it is best to use certain oils for certain smoke points. 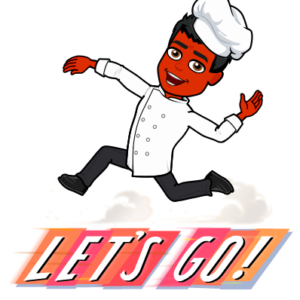 -The smoke point for coconut oil is 350 degrees Fahrenheit . -The smoke point for virgin olive oil is 391 degrees Fahrenheit. -The smoke point for extra light olive oil is 468 degrees Fahrenheit. -The smoke point for safflower oil is 510 degrees Fahrenheit. Any recipe cooked under 349 degrees Fahrenheit can be cooked with coconut oil. Any recipe cooked under 390 can be cooked with virgin olive 0il. Any recipe cooked under 509 degrees Fahrenheit should be cooked with safflower oil. *Note: Some folks encounter breakouts or increased inflammation when they eat to much salt or citrus. Discontinue or substitute the ingredients if needed. 1. Boil a large pot of water with the fresh tuna steaks for 15 minutes or until cooked. Drain. Put tuna in a large bowl. 2. Chop Basil Leaves and mix it in a large bowl with tuna, peppercorns, oregano and apple cider vinegar. 3. Fill the large Jar with the tuna mixture to about half way up the jar. Then pour olive oil on top until about half way or until mixture is submerged. 4. Put the rest of mixture into the jar. Then pour olive oil on top again, submerge the rest. 5. Seal Lid on jar and refrigerate until chilled. 6. 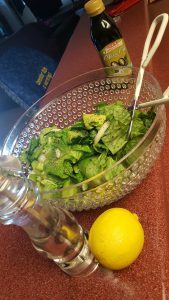 Chop chilled iceberg or romaine lettuce and put it on a big plate. 7. 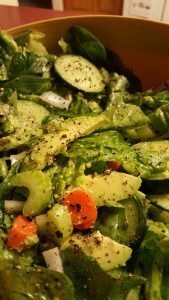 Peal and chop chilled cucumber into slices and place on top of lettuce. 8. Put 1 scoop of Tuna on top of lettuce and cucumbers. Better served chilled. 2. Wet bottom of pans with a few spoon fulls of olive or coconut oil. 3. 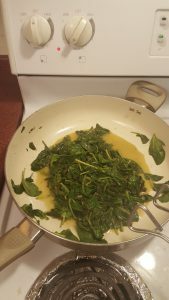 Open bag of fresh kale and pour onto two bakeing pans spreading the kale evenly. 4. Drizzle a little bit of olive oil or coconut oil on top of kale..
5. Bake in oven for about 15 – 20 minutes or until crispy. 2. Chop Onion and saute in oil for 1 minute on medium or until light brown. 3. Mix onions, ginger, and cilantro with green beans. 4. Sprinkle salt and sesame seeds. 1. Preheat oven to 375 and put 2 table spoons of olive or coconut oil onto baking pan. 2. Make sure the whole tilapia has no scales, organs, or gills. Rinse the whole tilapia and cut 3 slits one each side. For a total of 6 slits in all. 3. 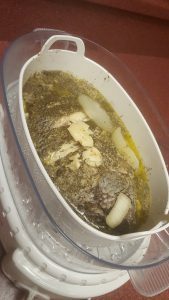 Place the whole tilapia onto baking pan with the head and tail still intact. 4. 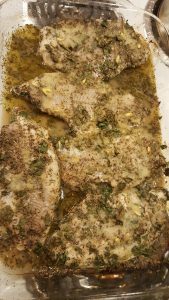 Cover both sides of the whole tilapia with apple cider vinegar, dill seasoning and mustard seeds. 6. Cover pan with foil and bake for 50 minutes – 1 hour or until fish flakes. 7. Remove from oven and remove foil carefully. Serve. Watch for bones. Note* The whole fish can be consumed, head and all. The brain matter and eyeballs have many nutrients. 2. Pour oil onto baking pan and wet each fillet with a light coat of oil, top and bottom. 3. Sprinkle pepper generously all over tilapia fillets. 4. Mix ground mustard seasoning, avocado mayonnaise, diced onions, fresh parsley flakes and lemon juice in a bowl. 5. Pour the mixture onto each tilapia fillet until they are all completely covered. Poke many fork holes into fillets. 6. 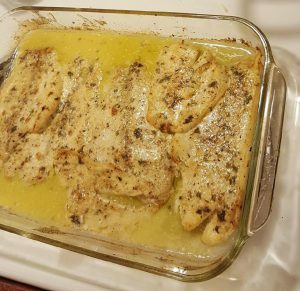 Broil uncovered for 6 – 9 minutes or until the tilapia fillets are golden brown. Do not burn. 7. Remove from oven and serve with a garnish of fresh parsley. Splash Olive oil into a big pan or pot. Pour all the ingredients into the pot on top of olive oil. Cook at medium temperature tossing spinach for three minutes or until wilted. Mix all ingredients an a big bowl and stir. Pour all contents into a big baking pan and spread evenly. Place pan in oven and bake for 30-40 minutes or until soft and tender. Rinse beans and place them in a huge pot. Bring to a boil, cover, and let simmer for 2 hours stirring occasionally. 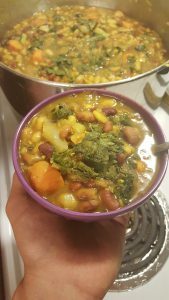 Add all other ingredients to pot, EXCEPT kale. Continue to simmer with lid on for 45 minutes. Stir occasionally. 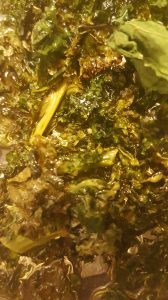 Stir in Kale. Cover with lid. Turn off stove. Wait five minutes. * This recipe can be cut in half for smaller house-holds. Put oil on large pan at medium heat. 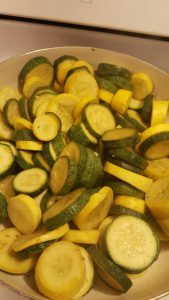 Add rinsed squash and zucchini slices on top of oil. Sprinkle half the pepper and half the cumin on top. Stir. Sprinkle the rest of pepper, and cumin on top. Cover and simmer for 10 minutes. Stirling occasionally. Serve when tender and moist. Put olive oil in baking pan and spread evenly. Mix parsley, salt, pepper, thyme, oregano and basil together. Cover cat-fish fillets on both sides with mixture and place evenly on baking pan. Mix lemon juice with garlic powder and pour on top of fish. Poke holes in fish fillets. Bake uncovered for 30-40 minutes or until fish flakes when poked with fork. Quickly place in sealed container until ready to serve. Toss all ingredients in a big bowl. Put oil on baking pan. 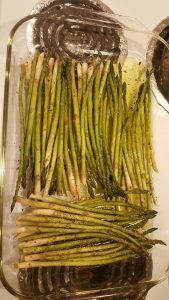 Rinse asparagus and place on baking pan on top of oil. Place uncovered in oven and bake for 25-30 minutes or until soft and tender. Mix Oil, lemon juice, and garlic in a bowl. Spread out a long sheet of foil onto a baking pan and place fish on foil. Wrap the ends of the foil upwards so juices don’t leak. Pour the mixture from the bowl onto the fish. 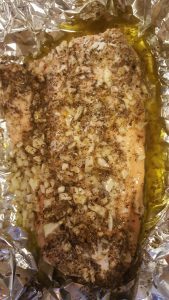 Sprinkle fresh pepper, oregano, and onions on top of fish. Wrap the ends of the foil over the fish to where is completely covered and wont leak. Place in oven and bake for 25-30 minutes of until fish flakes when poked with a fork. Put two table spoons of olive oil onto baking pan. 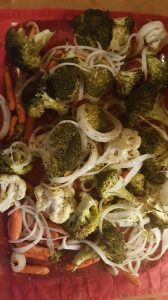 Place all the vegetables onto baking pan. 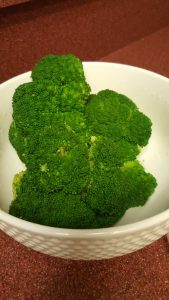 Pour remaining olive oil over broccoli and cauliflower. Sprinkle fresh black pepper all over vegetables. Place in oven, uncovered for 3o minutes. Soak them with apple cider vinegar for 2 minutes or peel them if wax is present. Prep steamer with distilled water. Pour Olive Oil and Apple Cider Vinegar into a bowl. Rinse catfish and place into bowl with the oil and vinegar to soak. In a separate bowl, mix parsley, cilantro, thyme, oregano basil, black pepper. 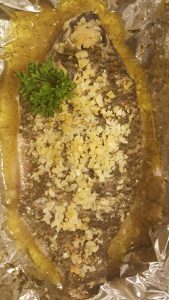 Cover fish fillets on both sides with herb mixture. Place fish inside steamer bowl and then place steamer bowl into steamer compartment. Sprinkle with celery and onions. Place whole green onion next to fish. Steam for 40 minutes or until fish flakes. 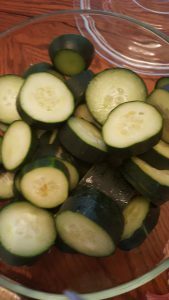 Soak cucumbers with apple cider vinegar for 2 minutes or peel them if wax is present. Make sure the whole tilapia has no scales, organs, or gills. Rinse the whole tilapia and cut 3 slits one each side. For a total of 6 slits in all. Place the tilapia inside steamer bowl and then place steamer bowl into steamer compartment. Cover both sides of the whole tilapia with apple cider vinegar, dill seasoning and ground mustard. Sprinkle fish with diced onions. Cover Steamer with lid and steam for 50 minutes – 1 hour or until fish flakes. Remove from steamer carefully. Serve. Watch and avoid bones. Note* The whole fish can be consumed, head and all. The brain matter and eyeballs have many nutrients. Watch and avoid bones. 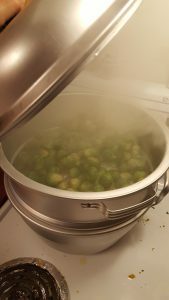 Prep steamer with distilled water..
Rinse and pour Brussels sprouts into steamer. Steam for 5 minutes or until soft and tender. 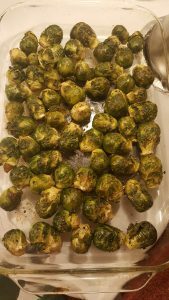 Remove from steamer, sprinkle with pepper and serve. This is the homemade recipes for psoriasis section of this website. If done in conjunction with The Do List and the Don’t List, it will help you cure psoriasis naturally and will also help you maintain beautiful skin thereof. Wow! Looks so tasty and exotic. You seem like a big fan of seafood. The only type of seafood permitted is non fired fish. A diet composed of non fired fish and vegetables with no counter productive ingredients are ideal for curing the psoriasis condition overtime. Is there a trend on the ingredients from these recipies? Is anything in particular that stands out? All homemade recipes for psoriasis should have no counteractive ingredients. When inflammation is involved, only certain foods are allowed for several months. These are some of the foods that are safe to eat give it you follow the 80/20 Alkaline/Acid Ratio. Look at all these yummy recipes! I’m crazy about tilapia, they’re vegetarian fish and not bottom feeders and I think that’s why the meat tastes so clean and good. And I’ve gotta try your tuna salad method, looks great! Thanks for the interesting fact about tilapia… and yes please try Drake’s Delicious Homemade Tuna Salad!! It is so delicious! You will not regret it. Wow, what a wonderful list of recipes. I love tuna fish salad. I especially love how many different veggie recipes you have. I had no idea about oil smoke points that is very interesting. Thanks for these recipes, I can’t wait to try some out. Yes be careful with smoke points. Good recipes. What is the big deal about Kale? I here them calling it the super food and all of that. Thanks. 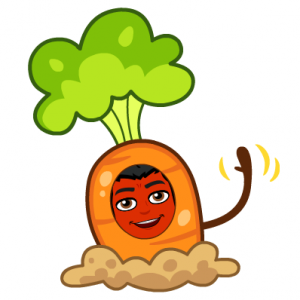 Yes kale is a wonderful super food, but remember, it is best to cook it because it’s an insoluble fiber. Only eat it raw sometimes, and in small portions. Thanks for the comment. Great info, Drake! It is funny how we tend to think eating healthy means not enjoying what we eat. I think these recipes will help a lot of people who need this sort of diet. I am curious, are you aware of any other, parallel health issues these recipes could be beneficial for? 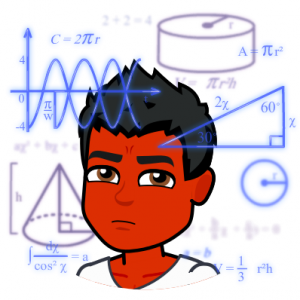 Great information for those who suffer from this issue. Another thing you might like to consider is goat’s soap. I had a friend who suffered from Psoriasis and I bought her some goat soap and it worked well. Just a thought. Loved the recipes – it sound like you are vegetarian – are you suggesting that people with this issue should not eat red meat? Hey Carol. I will look into your goat soap but for now I’m just posting vegetables and fish recipes. I try to follow Dr. John Pagano’s eating suggestions and red meat is not allowed unless it’s lamb. But like I said I’m only posting fish and greens. Just not shell fish because according to John Pagano many psoriatics have skin reactions. Eating at least 80% alkaline every meal minus counter productive foods is ideal. I do know that the foods we eat have a direct affect on our skin, and I believe natural remedies are best for healing. 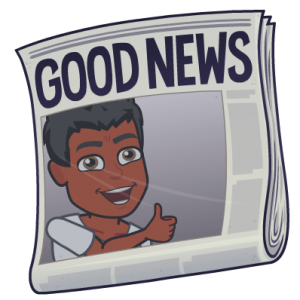 How long have you been helping people with psoriasis? I have a number of clients who suffer from this condition and it would be good to have these recipes for them to try out and calm down the outbreaks. Now fresh produce can be a bit pricy so does the veggies have to be fresh can they be frozen? 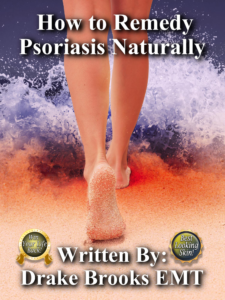 Hello Shannon, I have been helping people with psoriasis ever since I finished my book and website. So roughly, about a year. When it comes to produce, the fresher the better. Nutrients start to deplete shortly after harvesting so it’s important to take advantage of freshness. And I don’t know what super market you shop at but the produce section I visit is far less pricey than frozen vegetables. I guess probably because I’m in a agricultural part of Texas. Be careful with frozen foods because sometimes they add additives and preservatives. Your website is amazing, so full of information not just for psoriasis sufferers, but really for everyone that wants to be a fitter, healthier person, with skin that can be amazing! I started taking a combination of three vitamins D,E, and C about 18 months ago. I realised that when looking at the ingredients in moisturisers for the face most include these Vitamins, so I thought well why not take them orally as well! The 80/20 ratio diet is of course a perfect ratio for good health. It’s the body isn’t it ? crying out, when a rash appears, or hair loss, dry skin, blotches, etc. something is going wrong and we need to take note and take care. Thank you Michelle. It is great to know that my website is being bookmarked in someones else’s browser. I am a strong advocate when it comes to taking vitamins. And yes some of the good lotions claim to have vitamins, that says a lot. The 80/20 rule is key to awesome health and awesome looks. All the things you mentioned are all hints and symptoms that something is amiss. Clues that we are doing something wrong, and high probability it’s our diet.